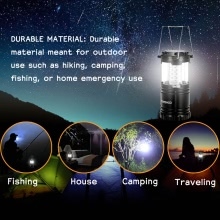 TOMSHOO camping lantern with 30 bright LEDs is a wise choice for hiking, camping or home emergency use! ULTRA BRIGHT: 30 LED bulbs bring you 360°of luminous light while saving energy. EASY TO USE: Just pull to light up and collapse the lantern to a smaller size when not used. FOLDAWAY HANDLES: Foldable handle is convenient to be carried or hanged in your tent, or hang it on a tree. DURABLE MATERIAL: Durable material meant for outdoor use such as hiking, camping, fishing, or home emergency use.